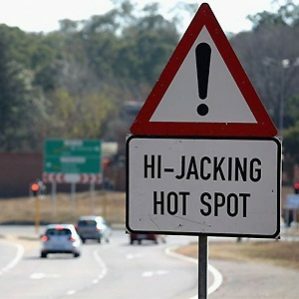 Hijackings are still an issue and still on the rise across the country, and driver should not start to become complacent when it comes to driver awareness. Chantal Hattingh, National Marketing & Communications Manager at Fidelity ADT says, “We continue to see incidents of follow-home hijackings and opportunistic hijackings throughout the year. Anyone who drives a car is at risk and needs to be aware and cautious”. Drivers are advised to wait in the road, and not in their driveways if they suspect they are being followed. If cars are behind you, wait for them to pass and wait until they are a far distance before entering your property. If you have a panic button, keep it in your hand just in case. If you have children in the car with you, the eldest child should be seated behind the driver, and the youngest to the left. The National Hijack Prevention Academy recommends going this route because if a hijacking does occur, you can move quickly from the driver’s door to the door directing behind you, and you while you reach across to unstrap your youngest child, the eldest child can cling to you as you remove them together from the car. If you do need to stop in your driveaway and manually open your gate, always leave the key in the ignition and your motor running, unless there’s a child in the car. The key is a valuable negotiating tool – they want your car but you want your child. In general, you should always be more alert when you get home. Check for strangers and strange cars, turn your radio off and hide your phone from plain sight, ask your children to be quiet and focus on your surroundings as you approach your home. If you see anything suspicious, contact your neighbourhood watch, security provider, or SAPS immediately. Don’t let your guard down just because you live in a complex or gated community. Hijackings can still happen right in front of the guards or complex, and you can still easily be followed into your complex. Research also reveals that a lot of people relax when they are closer to home and feel safer here, but that is when you’re the most vulnerable. But what happens if you are hijacked? And how do you hand over your car in a manner that your life will still be spared? The number one rule is not to antagonise the hijackers. They are most likely just as scared as you are, believe it or not. Show them that you are not a threat, have no weapons, and will surrender. Lift your arms up, unstrap your seatbelt with your left arm and put your car in neutral, but do not turn your car off. Try and angle your body sideways and don’t face them head-on in case they have a firearm. Protect your head with your arms and never make direct eye-contact but try to take in what they are wearing and what they sound like. But most importantly, remain calm.